When we were transitioning from unschooling to enrolling our kids at a Sudbury school, we saw it as a trade-off. We were losing some things and gaining some other things. It’s not that we decided that unschooling was bad or wrong. Instead, we were attracted to the benefits we thought our kids would get from the change. In practice, although we encouraged it, it was still up to them. Our daughter Morgan immediately loved it and never looked back. Our oldest son Sammy visited for a couple of weeks and then decided he wanted to stay at home instead. So we let him do that. There was no coercion involved; it truly was up to him. A year and a half later, he decided on his own that he wanted to do it after all, and now he looks forward to school every day too. 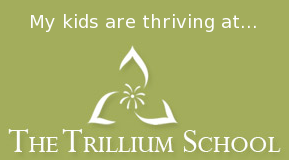 We love unschooling, but we love Sudbury schooling (specifically The Trillium School) even more. Many unschooling parents won’t be willing to let go of these benefits of unschooling. And I totally respect that choice. My point in “Unschooling vs. Sudbury schooling” was to compare and contrast two wonderful alternatives, not necessarily pit them against each other. But there was one phrase in my last post that hit a nerve, despite my intention to write objectively. Regarding what Sudbury schooling offers in differentiation to unschooling: “For a significant period of time each day…[kids] pursue their interests in a context that’s free from any form of (subtle or overt) parental influence.” I think it’s possible to read that as a factual statement without the connotation that being with parents is bad. Consider this: I wrote it, and I think parental influence is a good thing. Let me repeat: yes, I want to influence my kids—by my example and whatever wisdom I can share with them while they’re living with me. (No, I don’t want to control their choices. I trust that they are learning to make authentic choices on their own, that they will learn what they need to learn, and that they’ll grow into wonderful adult human beings.) By the way, please substitute a different word for “influence” if it inherently brings up negative connotations. There are good reasons for requiring this commitment, not the least of which is cohesiveness and continuity of the community. Regardless of the reasons, this is definitely an adjustment for families that aren’t used to it. It’s an adjustment for both the parents and the kids. But they are entirely free to opt out (as my son did). Oftentimes, it’s the kids (especially when they’re older) that find out about their local Sudbury school and convince their parents to make the commitment that they’re so ready to make. Note: In practice, attendance, while taken seriously, is flexible, provided that everyone is communicating. Policies will vary from school to school, but one family at Trillium is on a two-week vacation right now. They let the school know, and everyone was totally cool with it. Ultimately, I get the feeling from Wendy that she thinks that Sudbury schooling represents a fake form of trust. But which requires greater trust? Keeping your kids in your care all day, where you know what they’re doing and who they’re with at all times? Or sending them to a place where they are afforded the same sort of freedom but without you there to watch? Whether or not this is valuable is another question. We’re not having a “parental trust contest,” I hope. I’d rather focus on what’s best for particular families and particular kids. Sudbury has a lot to offer that unschooling doesn’t, and vice versa. Fact: Sudbury students are separated from their parents for a significant period of time each school day. Fact: Sudbury schools tend to be significantly larger and more diverse than individual families. As such, community agreements are made using a formal democratic process. Please consider that, by pointing out these rather obvious distinctions, I am not attacking unschooling. What I’m trying to do is this: help parents think through what their options are, comparing and contrasting different aspects of each approach. And I still haven’t even gotten to the benefits that I see as unique to Sudbury schooling. In other words, why might an unschooling family consider Sudbury schooling to be a desirable choice (as we did)? That will have to come in another post. I’m delighted to find your informative blog. Your entry about commitment was (dare I say) transformative, particularly the use of the idea of burning bridges. I’m wondering if you know of a site or blog entry that compares/contrasts the 3 Seattle-area Sudbury schools. I’ve read your perspective about Trillium – that it’s a great school. Do you have a perspective about the other 2? Trillium is starting its 5th year in the Fall. Clearwater has been around for much longer (12 or 13 years?). I believe Rising Tide School is starting their 2nd year this Fall. I haven’t visited or met them yet. I think it’s wonderful we have three Sudbury schools in Washington. I hope we get even more. Thanks for that information! I live in a cohousing community (Tierra Nueva on California’s Central Coast – http://www.tncoho.com) – and we’re in the process of starting a Sudbury, but I’m so tempted to jump to a school that’s already established.